Uncategories NDP with 98% chances of winning! 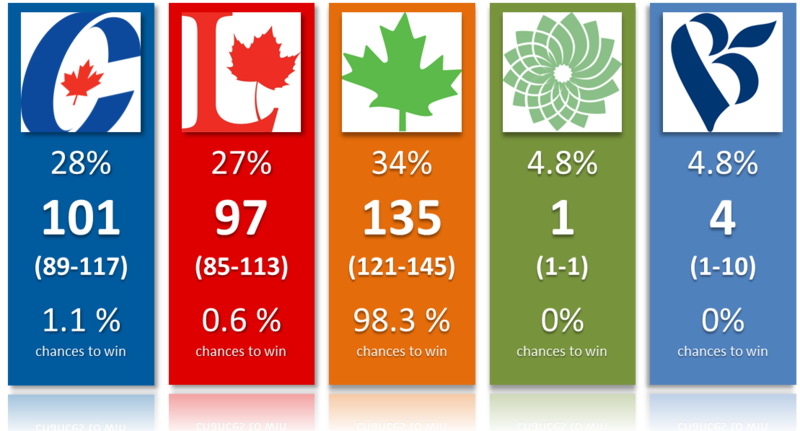 NDP with 98% chances of winning! A year ago, it seemed Justin Trudeau would not only win the election, but would also get a majority. That was partially due to a falling NDP that was getting closer and closer to the 20% mark. What a change a year can make! Indeed, if the election was tomorrow, the NDP would be favorite to win the most seats and Trudeau would be fortunate to finish second. Thomas Mulcair and his party would indeed have a 98% chances of winning the most seats! This is based on the three most recent polls (from Ipsos, Environics and Forum). Forum and Ipsos (two firms who often don't agree with each other) both have the NDP actually as high as 36 and 35% respectively. If people thought the post-Alberta (and post bill C-51) bump of the NDP would stop or be short lived, they were wrong. Not saying it'll continue or remain until October of course. You can find the detailed projections here. - No party is in a position to win a majority, not even the NDP. This party has an absolute max of... 168 seats. But even there, this would require a more than optimal scenario of underestimation in the polls and vote efficiency. - In Quebec, despite the return of Duceppe, the Bloc remains low. This party is indeed competitive again in many more ridings (and is at least not projected with zero seat), but the NDP hasn't really suffered. If anything, Mulcair is in a position where it's not unrealistic for him to gain seats in la Belle Province. - The Liberals aren't in a very good position, but they are definitely not out of the race. Chances of winning based on the three polls here are less than 1%, but at least it's not 0! They still dominate in the Atlantic, are in the race for first in Ontario and much higher in the Prairies than in 2011. - On this topic, it seems the real race right now is for second place. Although the Conservatives clearly have an edge for this second place with roughly a 2/3 chances over the Liberals. Bottom line, if the election was tomorrow, the most likely outcome would be a NDP minority with a Conservative official opposition and the Liberals in third just behind. The NDP is enjoying a lasting bump and one could wonder if this party has really reached its ceiling or not.